In the final week before the Breeders' Cup, there's little for trainers and their teams to do but wait. It can be a nerve-wrecking time for some. In the Steve Asmussen barn, which will lead four contenders over to the paddock this weekend (including Classic hopeful Gun Runner), you'd think there could be a lot of tension in the air. Luckily, Frank is on the case. Frank is eight pounds of doggie love and bravado, usually wrapped in a sweater. He belongs to Hanna Salmon, exercise rider/assistant to Joe Sharp, who meant to give him a temporary home after he was rescued from Shelby Park in Louisville. 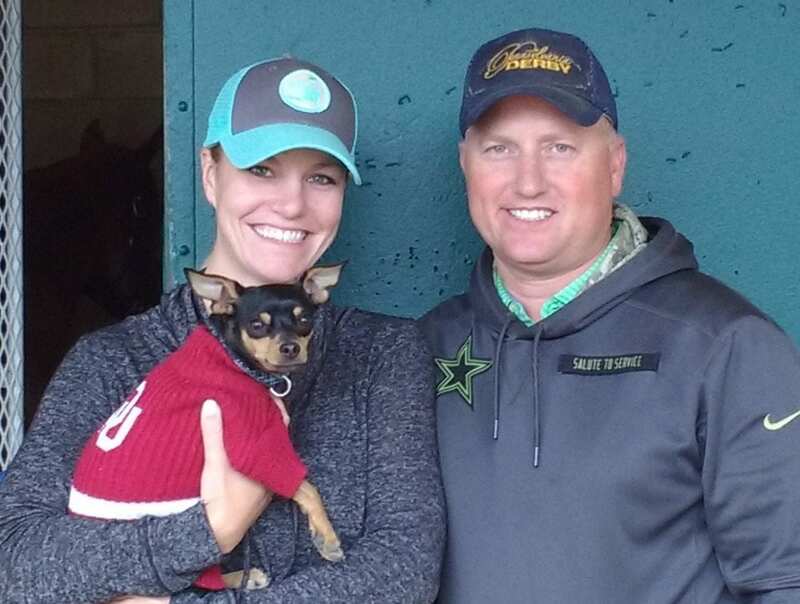 Salmon is dating Asmussen assistant Scott Blasi, who she says is about the last person anyone can imagine fawning over a tiny, purse-sized dog. To everyone's surprise, Frank and Blasi are inseparable. Frank goes everywhere with both of them, and even settles down with Blasi at a local sports bar when there's a ball game happening. The results came back: 30 percent Chihuahua, 50 percent Miniature Pinscher, and 20 percent mixed. Surprisingly, given his breeding and size, Frank is anything but a 'yippy' dog – in fact, Salmon has only ever heard him bark a couple of times. He is also completely unafraid of horses, but holds no illusions that they are playmates. 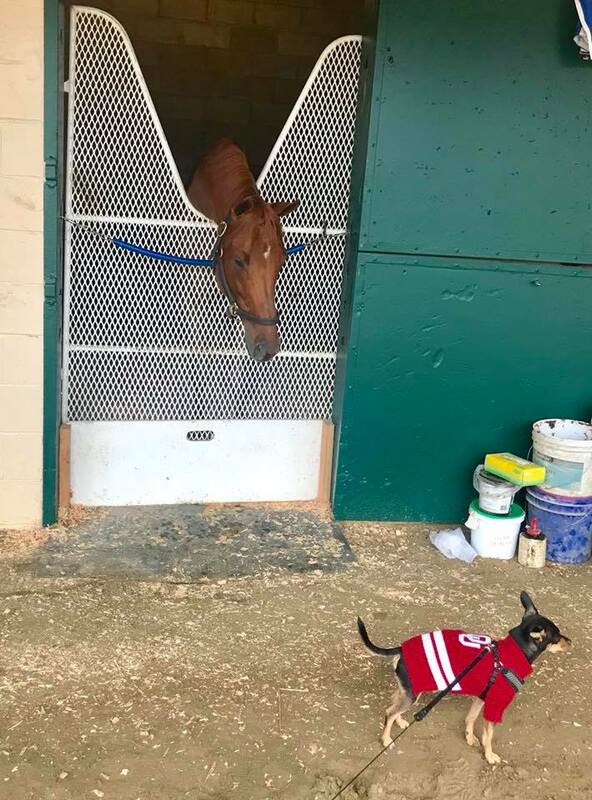 Salmon was excited to get a photo of a moment between Gun Runner and Frank earlier this week, because Frank is usually “wildly indifferent” to horses. After his humble beginnings, Frank is living the luxury life. He went on his first plane ride to Del Mar this month (he was unimpressed, and slept for most of it). He has gone to New Orleans and Saratoga with Salmon, and is about to head south for the winter when the Sharp stable moves. Frank has sweaters or jerseys for most every one of the couple's favorite sports teams, including a Dallas Cowboys hoodie, complete with a tiny hood. Salmon said before she had Frank, she thought doggie outfits were a little much, but “he genuinely gets cold if it's less than 70 degrees out.” Frank has a lifeguard tank top and an actual doggy life vest for swims and trips out on boats, which he enjoys. 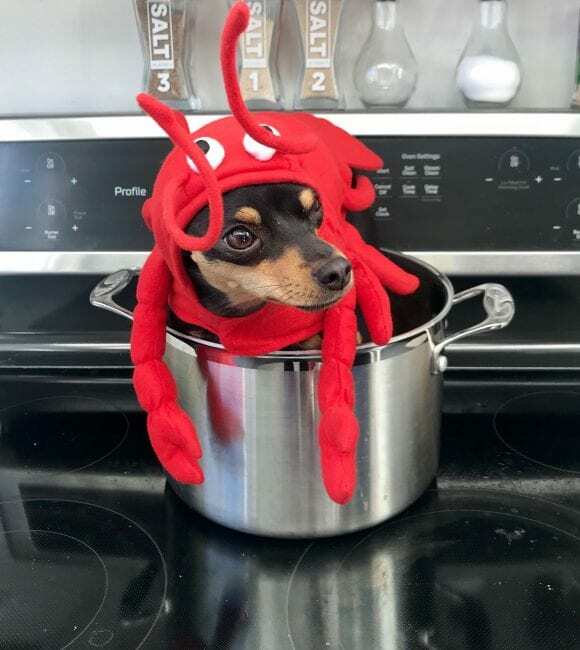 And of course, in honor of Halloween, he has costumes: a hot dog costume, and a lobster costume. This entry was posted in Barn Buddies, Horse Care, NL List and tagged 2017 breeders' cup, barn buddies, gun runner, Joe Sharp, rescue dogs, scott blasi, steve asmussen by Natalie Voss. Bookmark the permalink.